Singapore: Asian stocks advanced on Thursday as oil prices struggled to climb off a 10-month low hit overnight on concerns over a supply glut and falling demand. MSCI’s broadest index of Asia-Pacific shares outside Japan climbed 0.3 percent. Japan’s Nikkei fell 0.1 percent, with shares in auto air bag maker Takata Corp plunging 50 percent as they exchanged hands for the first time since sources said last week it was preparing to file for bankruptcy. 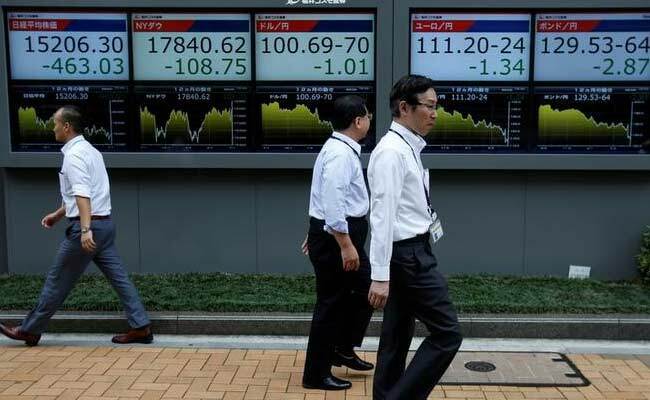 South Korea’s KOSPI added 0.2 percent, while Australian shares jumped 0.6 percent. Chinese shares added to gains made on Wednesday after MSCI included mainland shares in its emerging market indexes. The blue-chip index rose 0.4 percent. Hong Kong’s Hang Seng was flat. Crude oil crept up from multi-month lows hit on Wednesday after data showed a drop in U.S. inventories, but gains were capped as investors fretted about whether OPEC-led output cuts would dent a three-year glut. “The time for contrarian trades in oil is fast approaching, but I would want to see some stability in price and the technicals start to become more convincing,” said Chris Weston, chief market strategist at IG in Melbourne. U.S. crude futures rose 0.1 percent, or 5 cents, to $42.58 a barrel. They closed down 1.6 percent on Wednesday after touching their lowest level since August. Global benchmark Brent climbed less than 0.1 percent, or 3 cents, to $44.85. It closed down 2.6 percent on Wednesday after touching a seven-month low. The resulting decline in oil shares hit indexes in Europe and on Wall Street overnight. Britain’s FTSE, Germany’s DAX and France’s CAC 40 closed between 0.3 percent and 0.4 percent lower. The Dow Jones Industrial Average closed down 0.3 percent, while the S&P 500 was slightly lower. Nasdaq closed up 0.7 percent, lifted by biotech stocks. Financial stocks also contributed to losses on Wall Street, driven lower by a drop in the Treasury yield curve to its flattest in almost a decade, as investors tried to reconcile a hawkish Federal Reserve with deteriorating inflation measures. Boston Fed President Eric Rosengren and Fed Vice Chair Stanley Fischer suggested they are concerned less about raising rates too fast or too high than about keeping them too low for too long. “I think the market may be pricing in a little higher odds of another rate hike before the end of the year, and that is helping drive some of the flattening,” said Gennadiy Goldberg, an interest rate strategist at TD Securities in New York. The yield curve between five-year notes and 30-year bonds flattened to 95 basis points, the narrowest since December 2007, on Thursday. The dollar eased, falling 0.3 percent to 111.03 yen. The dollar index edged lower to 97.502, extending Wednesday’s 0.2 percent loss. The New Zealand dollar gained 0.4 percent to $0.7248 after the central bank left its interest rate unchanged at a record low as expected and reiterated it would remain steady for a while. Sterling was slightly lower at $1.267 after Wednesday’s 0.3 percent gain on comments by the Bank of England’s chief economist that he was likely to vote for an interest rate hike this year. Until now, he has been seen as largely supportive of keeping rates low. The euro was flat at $1.117, holding on to Wednesday’s 0.3 percent gain. The weaker dollar lifted spot gold, which rose 0.6 percent to $1,252.60 an ounce.